There are times when the everyday world gets too complicated and you need a little escape. Sadly, modern comics rarely provide this escape, with their incomprehensible continuity, angst-ridden heroes, and unhappy endings. 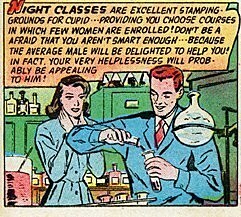 It's times like this when you can turn to 'The Golden Age Romance Comics Archive'. This little archipelago of stories, where nothing's too complicated to be solved in eight pages and no story is too tragic to end with a passionate kiss, is a fun read for a gloomy afternoon.Jenny Miller, the curator of this little collection of melodrama writes that she likes romance comics because she "[doesn't] have an appreciation for the finer things." The Archive contains a short history section which expounds the popularity of romance comics, as well as naming a few famous alumni like Jack Kirby and Joe Simon. The meat of the comics, though, is the melodrama. 'Redhead on the Range,' 'I Was Ashamed of Him!' and 'Which One for Me?' chronicle the lives of women whose perfect happiness with a perfect man is occasionally delayed - but never stopped - by glandular problems, dark secrets, men with mustaches, and of course, always, their own foolish pride. The happy ending is guaranteed, though you have to flip through pages of misunderstandings, tears, and bulky fifties-style underwear ads to get to it. The short stories and the outrageously antiquated, well, everything, make the comics a fun, fluffy read. 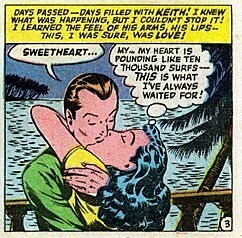 And, if you're lucky, you get to see a woman making out with Namor. No doubt that will end well.